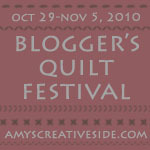 So I waited till the last minute to enter a quilt for the Blogger's Quilt Festival. Better late than never. And thanks to Amy for making this happen! This quilt pattern is called Maisies Daisies by Buggy Barn. And the fabric used is called Iced Mocha, also by Buggy Barn. I made this quilt to potentially teach a class on how to put together buggy barn quilts. I have done a few now and they are really fun and fat quarter friendly. Now I can only imagine how it would look using the fun new retro fabrics....some day. ...a little something about me...I like to go in quilt shops and pick out fabric, carry it around, feel it in my hands, admire it, and after about 10 minutes, I put it back. It's almost like buying it, but not. If that makes sense. It's a quick fix for me! Just don't tell the quilt shops!